The Maui News reported that this “fine piece of road” was of “practically no benefit”. 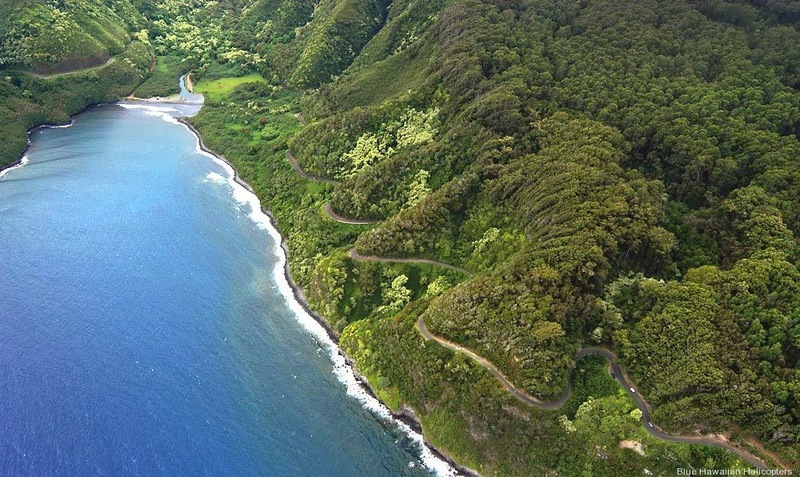 OK, it’s called “Hāna Highway” but that name conjures up the wrong images of what this roadway is all about. Drive slowly, because you can’t drive fast, anyway. It’s 52-miles long; there are 620-curves, 59-bridges and 8-culverts … in your slow motion ride, along the way you will also see a variety of scenic views, including the ocean, mountains, sea cliffs, waterfalls, small villages, native and exotic vegetation and traditional landscapes. This transportation link has a long history … let’s look back. Back in the 15th Century (around the time Columbus was crossing the Atlantic,) Maui was divided into two Royal Centers, Lāhainā and Hāna. Back then, the canoe was the primary means of travel around and between the Islands. Piʻilani, ruling from the Royal Center in Lāhaina, where he was born (and died,) gained political prominence for Maui by unifying the East and West of the island, elevating the political status of Maui. Famed for his energy and intelligence, Piʻilani constructed the West Maui phase of the noted Alaloa, or long trail (also known as the King’s Highway.) His son, Kihapiʻilani laid the East Maui section and connected the island. Four to six feet wide and 138 miles long, this rock-paved path facilitated both peace and war. It simplified local and regional travel and communication, and allowed the chief’s messengers to quickly get from one part of the island to another. 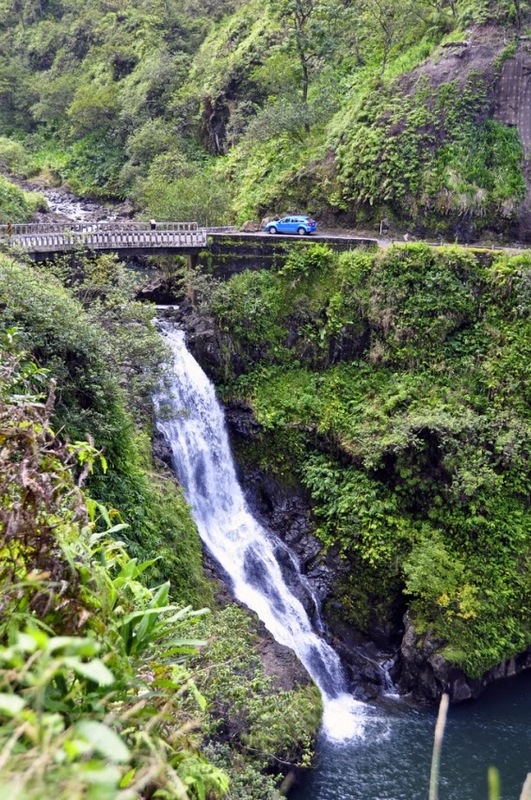 The first modern roads on Maui began to be built around the late-1800s. Many of these early roads led to and from different plantations in the town of Hāna, where sugar, pineapple, wheat and rubber all flourished. In 1849, George Wilfong opened the first sugar mill in Hāna near Kaʻuiki Hill. By 1883, the number of sugar plantations in Hāna grew to six. At this time there were small roads going from one plantation to another, as well as partial routes to Kahului from Hāna or from Pāʻia to Hāna. The problem was a lack of reliable roads into and out of Hāna. Beginning in 1908, in anticipation of road improvements, twenty-four solid-paneled, reinforced-concrete bridges were built by 1915; from 1916 to 1929, an additional thirty-one bridges were built with a reinforced-concrete. It is not just a road; it is an attraction … for all, an experience. In August 2000, the Hāna Highway was officially designated a Millennium Legacy Trail. The designation is given to trails that reflect the essence and spirit of our nation’s states and territories. Millennium Legacy Trails are representative of the diversity of trails; rail-trails and greenways, historic trails, cultural itineraries, recreation paths, waterways, alternative transportation corridors and many other types of trails. (Rails to Trails Conservancy) On June 15, 2001, it was added to the National Register of Historic Places. The image shows a portion of the Hāna Highway. I added other images in a folder of like name in the Photos section on my Facebook and Google+ pages. In June, 1925, Governor Wallace Farrington and the County Board of Supervisors Chairman Samuel Kalama led a grand procession of cars on the official opening of the road from Kailua to Hana. The road was called the Belt Road and would link the isolated communities of East Maui with the rest of the island. By December, 1926, the governor and the board chairman were able to drive all the way to Hana on the dream road that was fast becoming a reality. Wait … Let’s step back a bit. Handy, Handy & Pukui report that in ancient times there were several major population centers on the Island of Maui: Kahakuloa (West Maui) region; the deep watered valleys of Nā Wai ‘Ehā (Waiheʻe, Wai‘ehu, Wailuku and Waikapū;) the ‘Olowalu to Honokōhau region of Lāhainā; the Kula – ʻUlupalakua region and the Koʻolau – Hāna region. Settlement in the watered valleys along the Koʻolau coast consisted primarily of permanent residences near the shore and spread along the valley floors. Residences also extended inland on flat lands and plateaus, with temporary shelters in the upper valleys. Neighbor Island prison camps were set up, there were 4: Maui had three, the other was on the Big Island (outside Hilo.) Keʻanae camp had 22-prisoners and 3-guards; Olinda camp had 31-prisoners, with Jailer and 3-guards and Paukakulo camp had 27-prisoners, with 1-jailer and 3-guards. The three camps on Maui are engaged in road work and forest lines. In December 1942, during World War II, Governor Ingram Stainback tried to assist the war effort by sending forty inmates from Oʻahu Prison to the former Keʻanae Prison camp to revive the old Nāhiku rubber plantations in the hope of yielding 20,000 to 50,000-pounds of crude rubber annually. The venture was no more successful than the earlier ones had been. Eventually, in 1949, the camp was acquired by the YMCA and is still used by the “Y;” part of the land area continues to be used as a roadway base yard. The image shows Hāna Highway (BlueHawaiiHelicopters.) In addition I have added other images related to the property in a folder of like name in the Photos section on my Facebook and Google+ pages. There were five primary CCC camps built in Hawaiʻi (the CCC Compound at Kokeʻe State Park, the most intact today; what is now a YMCA camp at Keʻanae on Maui; a research facility on the Big Island; Hawaiian Homes Property with only two buildings remaining on the Big Island; and part of Schofield Barracks in Wahiawa on Oʻahu.) Other temporary campgrounds were spotted in work areas around the Islands. The old Civilian Conservation Corps (CCC) Camp in Kokeʻe State Park on Kauaʻi is a complex of eleven wood frame buildings surrounding an open grassed quadrangle. These buildings were constructed in 1935 and are sheltered on three sides by koa/ʻōhia forest. (Hui O Laka/Kōkeʻe Museum use and operate within these structures, today.) The CCC at Kokeʻe provided forest management, building trails, roads and fences, as well as planting over a million trees on Kauaʻi. In 1934, the CCC took over the Keʻanae prison camp (initially built to house prisoners who worked at building the Hāna Highway.) CCC assembled men from other parts of Maui and other islands to plant thousands of eucalyptus and other introduced trees throughout the Hāna coast. (McGregor) Eventually, in 1949, the camp was acquired by the YMCA. Part of the land area continues to be used as a roadway base yard. Major duties included maintenance of trails, developing the Mana/Keanakolu wagon road into an auto road (placing cobble stones to form a single-lane road,) construction of fences to keep cattle and sheep out of the forest, and the planting of a variety of forest and fruit trees. In all, over 20-varieties of pear, 25-varieties of plum and 60-varieties of apple were planted. (Mills) By the 1940s, the CCC camp at Keanakolu was converted into a field station for territorial rangers and is now used by DLNR. 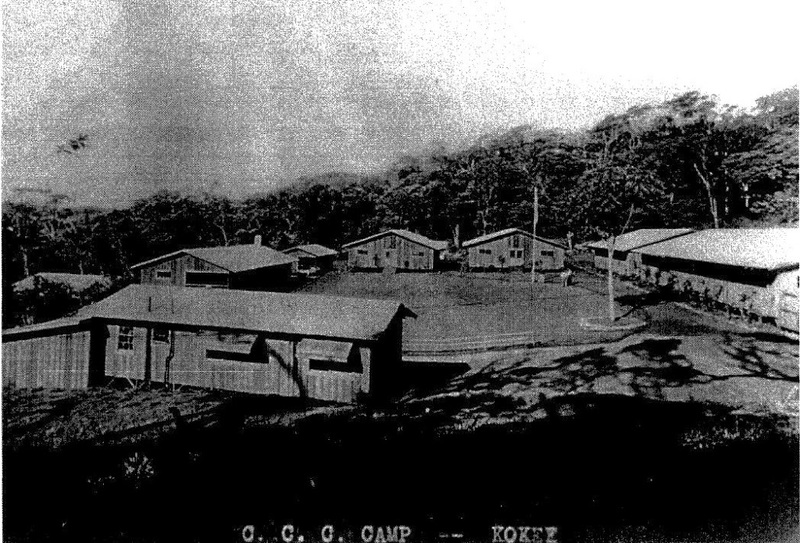 The image shows the Kokeʻe CCC camp in the 1930s (NPS.) In addition I have added other images related to the property in a folder of like name in the Photos section on my Facebook and Google+ pages. If you are going to tell a story about Keanae, in Koʻolau on the coast of Maui, the story starts with water, and with it, the life of the land. These watered valleys and gulches, and their associated flat lands (kula), have been home to and have sustained native Hawaiian families for centuries. Handy, Handy & Pukui report that there were several major population centers on the Island of Maui: Kahakuloa (West Maui) region; the deep watered valleys of Nā Wai ‘Ehā (Waihe‘e, Wai‘ehu, Wailuku and Waikapū); the ‘Olowalu to Honokōhau region of Lāhainā; the Kula – ‘Ulupalakua region and the Koʻolau – Hana region. In 2005, the DOE announced the closure of the last one-room school in the state of Hawaiʻi (in Keʻanae,) just a few weeks before the school year began. 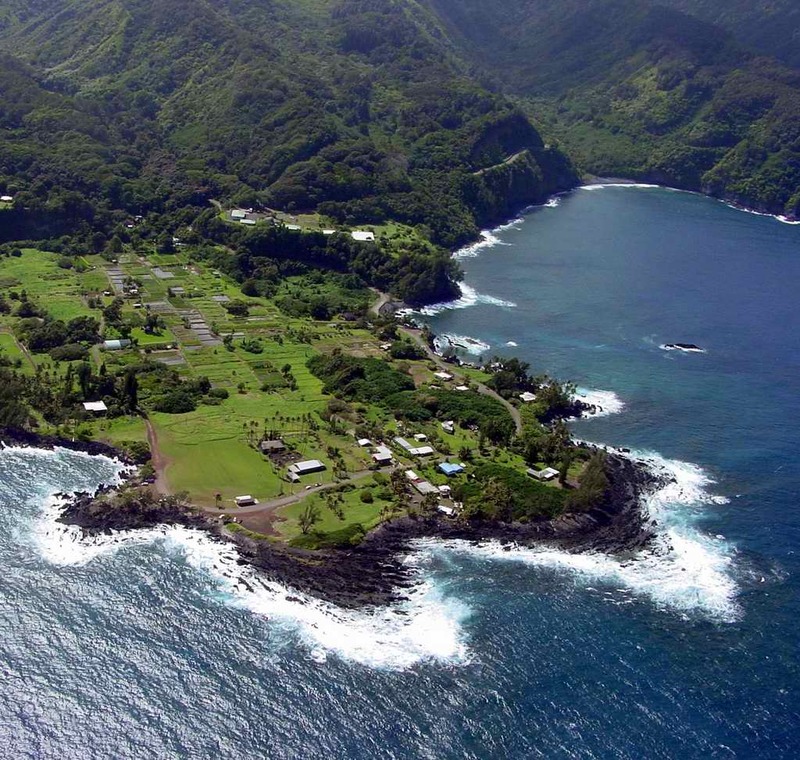 The village of Keʻanae had its own school for 96 years. Since then, Keʻanae students have made the 16-mile, one-way trek to Hana School. Reportedly, a Keʻanae Charter School has been proposed by community members. Last year, the non -profit group Ka Waianu o Hāloa launched a fund-raising effort in support of the establishment of a charter school in Keʻanae. Today, Keʻanae continues to be a relatively isolated, but significant taro-growing community; it is one of the major commercial wetland taro farming regions in the state. Keʻanae residents reportedly use the terms “inside” and “outside” to express the difference between life in their rural heartland and the new world of towns and cities where most Hawaiians live today. While at DLNR, I was involved through the Land Board and the Water Commission (both of which I chaired) on several issues related to Keʻanae – all focused on historic stream diversions and the impacts to downstream users, particularly the taro farmers there. The Land Board authorized the release of an additional 6-million gallons per day for downstream uses, as well as appointment of a monitor to determine that this amount will meet the needs of the downstream farmers, as well as monitor other aspects of the decision. The image shows Keʻanae point. In addition, I have added other images of Keʻanae in a folder of like name in the Photos section on my Facebook page.